"The first prime minister of Greece to visit North Macedonia. Truly historic day," he wrote on Twitter. 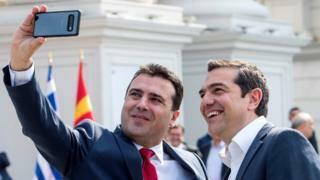 Tweeting the selfie, Mr Zaev referred to "happy moments for an even happier future for the peoples of our friendly countries". The two men signed a series of agreements before holding a joint news conference, in which Mr Zaev spoke of his opposite number as a "close, personal friend". Greece had always objected to its neighbour's use of "Macedonia", because of the northern Greek province of the same name. Under last summer's Prespa accord, the two countries agreed that the Balkan state would become the Republic of North Macedonia, in return for Greece backing its long-stalled bids to join Nato and the European Union. Arriving in Skopje, Mr Tsipras said the "historic visit" began by crossing the Friendship motorway, whose name was changed from Alexander of Macedonia motorway in February 2018 as part of efforts to improve relations. Ahead of his arrival, Mr Tsipras gave an interview with media in North Macedonia in which he acknowledged that "a significant portion of the Greek people was and still is seriously concerned about this issue". An opinion poll late last month suggested 73% of Greeks "probably disagreed" with the Prespa agreement.